There was a full moon in Pisces on August 26th. I decided to set an alarm for 4:20am so I could go outside and bathe in its light. I got out of bed and put on a dress, then I stood in my yard and looked at the moon. I closed my eyes and tried to think of nothing except what was presently happening. I heard the wind through the leaves in the trees, making soft rustling noises. I felt the chill of the wind on the bare skin of my arms. I felt the hairs on my arms stand up. I opened my eyes and looked at the moon some more, then I sat on my porch and smoked a spliff. I was inspired to do a full moon ritual after reading the newsletter from this astrology page I subscribe to. The newsletter described the full moon in Pisces as a “rinsing of the residue,” which appealed to me because I feel like I’m always trying to get over something. 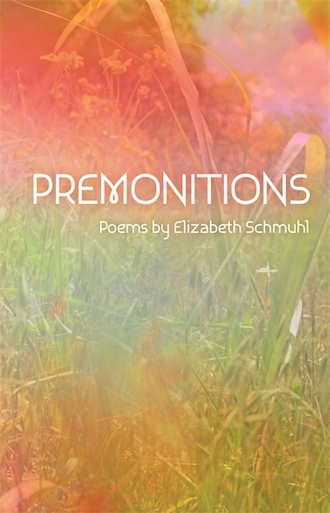 I was also inspired by my recent reading of Premonitions by Elizabeth Schmuhl, a new poetry collection published by Wayne State University Press (September, 2018). I don’t know how much residue got rinsed but focusing on the moon did feel cleansing, and I think it helped me write this review. “I stopped using the internet years ago,” opens Premonitions. Schmuhl continues the thought in the next line of the opening poem, “All of the places I wanted to go weren’t there,” before introducing the landscape that surrounds this collection of poems: a dreamy, pastoral world of blackberry blossoms, storms, hungry coyotes, the woods, cut flesh, and flowering bones. I think Premonitions is about living in real life, feeling disconnected from all the surrounding life, and feeling comfortable with and becoming part of the earth. Offerings of bodies are made to the earth: the speaker’s body, the body of a slaughtered dove, still bloody and beating. Berries are smeared on the flesh, bodies get covered with leaves. There is a loneliness that rings through the collection, a desire to disappear from the present form and become enmeshed with the natural and the wild. “I am following the pleasure of the storm until I am inside of it,” Schmuhl writes in #59. “The fish from the river that cuts through this place are swimming through my veins,” Schmuhl writes in #9. Schmuhl writes using nature in a very visceral way. The technique is not cliche, despite the well trodden history of nature featured in poetry. I’ve personally never written about nature, or really thought about or used it in my writing, and reading Premonitions on my stoop in the evening, listening to the nocturnal animals in my neighborhood scurry from tree to rooftop, made me want to rethink that. Seasons always seem like they’re just about to change, spring to summer, summer to fall, or they seem to drag on forever. We feel the seasons surrounding us. We feel the hot stuffy air in the barn and make peace with it. We understand the lightning bugs better than the guy who says the only way to catch them is to pinch their bottoms. The word “premonition” means a strong feeling that something is about to happen, usually a bad thing, and that is definitely the feeling that lingers within the reader while reading through this book. I liked that a lot. I don’t think that’s an easy feat to achieve. Some lines render like incantations, reminders, as in poem #131, where Schmuhl writes of the orchard that features heavily in the collection: “It is a place I keep forgetting. / It is a place I don’t want to forget.” I guess this is what I look for in poetry, and what I try to do when I write it. I don’t want it spelled out to me but I want to feel it. I don’t even need to know what it’s about, but I want to take it with me and let it become a part of me, like a memory. I liked this book. I’m probably going to be thinking about it for a while.